Home / SURPLUS, military and civilian. 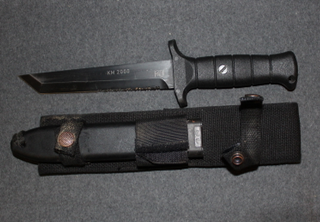 / KM2000 Combat knife, German army. Original issued german army KM200 combat knife. These knives are original BW items, all of these show some wear and some dirt is also possible, but nothing that cant be sharpened or cleaned out. These are made by the legendary Eickhorn or Borkott & Eickhorn Waffentechnik, some are supplied with the plastic belt loop and some have a cord in the tip of the sheath. Extremely durable, very good for breaking places and other more sinister uses. Steel is super-strong and gives a really good sparks from a ferrocerium flint. The better graded of these are in very fine condition, maybe a little sharpening or some cleaning with rag / cleaning oil is required, best ones are very close to unissued. The more used ones are in usable condition, but most of these require some minor work with wheatstone and sometimes good cleaning is required. The blades or handles or sheets are in good conditions in these ones, they just look like a knife will look if used in military operation for few months. Tanto shaped Kalgard coated blade goes thru the fibre reinforced plastic grip. Check out your local legislation about importing bladed weapons. We really do not wish any legal issues for our customers.